Part memoir, part parenting guide, The Song of Annie Moses is written in a cadence every bit as beautiful and fluid as the music the Wolaver family creates as The Annie Moses Band. Award-winning lyricist Robin Wolaver traces her family’s musical heritage back through her entire lineage to her grandmother, Annie Moses, who unknowingly birthed a love of the arts in her future granddaughter and subsequent grandchildren. Wolaver’s journey starts in mountain poverty and ends on a stage at Carnegie Hall. From her impoverished beginnings deep in the Kiamichi Mountains, the pastor’s daughter shares memories from childhood, emphasizing her deep, musical roots. Wolaver’s early penchant for playing the piano and singing led her to Oklahoma City University where she studied vocal techniques and fell in love with classical music and education. While at OCU, she met her husband, Bill, and the two moved to Waco, Texas, after their wedding. In Waco, Bill worked for Word Publishing as an editor, while Wolaver continued to jump through hoops to obtain her degree—the portrait of perseverance. Meanwhile, the couple welcomed a baby girl, Annie, into their music-soaked lives. The Wolavers went on to have five more children and eventually moved to Nashville and then to Connecticut to seek out the best educational opportunities available for their growing family, culminating in a prestigious Juilliard education for their talented brood. Wolaver provides a behind-the-scenes look at how her six children honed their craft, all the while learning spiritual disciplines. It’s evident from the first chapter that she is an extremely well-read, well-educated writer. She expertly weaves a tale of grace as her story unfolds and the dreams of Annie Moses are realized in the lives of the young Wolaver children. The road to Juilliard for her protégées is paved with man-made hurdles, financial difficulties, unmatched discipline and unwavering faith. All the while she unravels an intriguing parallel story of the origins of Christian music and the part she and her husband played in the industry as songwriters early in their career. While the story of Annie Moses’ legacy plays out at a steady pace, Wolaver diverges off the path of storytelling once she reaches motherhood to communicate her views on topics ranging from nutrition and homeschooling to spiritual and artistic discipleship. Her opinions regarding parenting are strong and direct. She doesn’t pull punches. Wolaver sees no distinction between the arts and one’s spiritual life, and she goes to great lengths to support this school of thought. A large appendix provides further advice for parents, especially those interested in immersing their children in the arts. The book dusts for fingerprints of grace throughout Wolaver’s rich musical genealogy—one that shaped her family’s destiny. However, it equally provides a platform for Wolaver to detail her specific approach to parenting. While readers will enjoy the candid stories—ranging from the humorous to the inspirational—and tracing the perfection of God’s plan throughout the life of her family, they may not always agree with Wolaver’s parenting directives. Rigorous schedules and intense hours of practice molded the Wolaver kids into the acclaimed performers they are today, averaging over 80 concerts annually across North America, but such diligence didn’t come without great sacrifice. Although the Wolaver’s lifestyle didn’t accommodate for much in addition to classical musical, the results of their hard work are phenomenal. Regardless as to what degree readers side with her ideas on parenting, Wolaver’s story is a testament to the fact that steadfast, hands-on parenting results in well-rounded, confident children. It also upholds the belief that God directs our steps even before we’re born, with our unique talents and passions in mind. 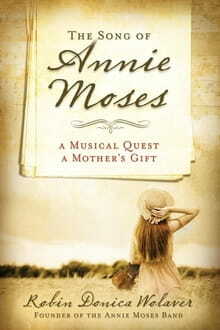 Wolaver’s greatest hope is that The Song of Annie Moses will inspire other parents to draw from their heritage, lean on timeless truths from God’s Word and relentlessly call out and encourage the gifts and talents in their children.